The Grand Strand is a 60-mile stretch of coastline that extends from the North Carolina state line at Little River southward to historic Georgetown and Winyah Bay. The name "Grand Strand" refers to the beautiful white sand beaches that crown this spectacular section of Atlantic coast line, which is most famous for the beach and golf resort Myrtle Beach. 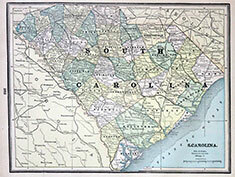 The Pee Dee Region is the sprawling section of South Carolina that drains into the Great Pee Dee River. It extends from the North Carolina state line in the north to the Winyah Bay in the south, and its historic and traditional center is the city of Florence. The Low Country is traditionally considered to be the geographic and cultural region that stretches along the Palmetto State's Atlantic coastline from North Carolina to Georgia. It includes the picturesque South Carolina Sea Islands, and its cultural center is his historic Charleston. Neighboring North Carolina includes the coastal counties of Brunswick and New Hanover, which have historic and cultural connections to Northeastern South Carolina - and which offer popular day-trip attractions for visitors to South Carolina's Grand Strand. 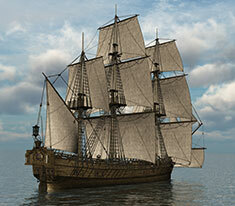 South Carolina's Ports and tall sailing ships like this one were important for trade in raw materials such as cotton and indigo with England. An ancient pre-Columbian Native-American historic site, the Sewee Shell Mound is accessed by a hiking trail in Francis Marion National Forest. Visitors may begin their tour at the Sewee Visitor and Environmental Education Center, located at 5821 U.S. 17 North, in the town of Awendaw. Bell Isle was the plantation home for Gabriel and his brother General Francis Marion. Several important grave sites are located here. Boone Hall Plantation and Gardens is a restored plantation from the Colonial and Antebellum periods of South Carolina history. Although the manor house is modern, the brick slave cottages date from the time when Boone Hall was a working rice plantation. Historic Bull Island and the Cape Romain National Wildlife Refuge offer a unique combination of South Carolina history and natural history. Bull Island was frequented by the pirates of the Colonial Era, by British sailors in the Revolution, and Northern troops in the Civil War. Ferry transportation and tours may be arranged through Refuge headquarters. Charles Towne Landing was the site of the first permanent European settlement in the Carolina province. Approximately 148 colonists, including men, women and children, landed at Albemarle Point the first Wednesday in April 1670. The oldest museum in the United States, the Charleston Museum was established in 1773. Its numerous exhibits, displays and artifacts survey South Carolina's rich history and culture. In 1697, Congregationalist settlers from Dorchester, Massachusetts, founded a town on the banks of the all-important Ashley River. For nearly 100 years, Dorchester prospered as an inland trade center for the region. The historic site where the American Civil War began, Fort Sumter is located on a small island in Charleston harbor and may be reached only by boat (the map link is for the ferry from the Charleston waterfront). Nearby Fort Moultrie on Sullivan's Island is part of Fort Sumter National Historic Monument and is the Revolutionary War site where South Carolina earned its name as the Palmetto State. The Francis Marion National Forest is located north of Charleston, South Carolina. It is named for Revolutionary War hero Francis Marion who was known to the British as the "Swamp Fox". Click title above to visit the external web site for the Frances Marion University Trail Commission in a new window for more information about this entry. Click title above to visit the external web site at www.gullahgeecheecorridor.org in a new window for more information about this entry. Maintained by the S.C. Department of Parks, Recreation and Tourism, Hampton Plantation State Historic Site preserves a Colonial-era rice and indigo plantation on the Santee River delta, approximately 16 miles south of Georgetown. Located on the coast, 33 miles north of Charleston, the historic town of McClellanville was an sleepy fishing village and retreat for Georgetown and Santee River rice planters in the 19th century. The McClellanville Historic District is composed of historic homes, churches and commercial properties that date from the late 19th and early 20th century. Overlooking Charleston Harbor in Mount Pleasant, Patriots Point Naval & Maritime Museum is best known for its centerpiece attraction - the World War II-era aircraft carrier USS Yorktown. The site is also home to other historic vessels, 25 military aircraft and the U.S. Medal of Honor Museum. Seaside Farms is the home of infamous bootlegger John Long. Long made great amounts of money using the inlets around Isle of Palms, Sullivan's Island, Dewees Island, and Mt. Pleasant to import illegal booze during the imposition of The Volstead Act (Prohibition).